a) He Who is the abode of all creatures. b) He Who dwells in the hearts of His devotees. c) The dwelling place of the Great Elements. The word bhUtAh can be derived from the root bhU - bhav - to be; bhavantiiti bhUtAni. The word vAsAh is derived from the root vas - nivAse - todwell. SrI satyadevo vAsishTha gives the derivation - samantAdvasanti bhUtAni yasmin sah bhUtA-vAso vishNuh - He in Whom all beings everywherelive is bhUtA-vAsah. "O Lord, I behold in Your body all the gods and all the diverse hosts ofbeings, brahma, Siva, the seers, and the lustrous snakes" - (arjuna's wordsas he has the viSva rUpa darSanam). "There is nothing higher than Myself, O arjuna. All this is strung onMe, as rows of gems on a thread". He is the Soul of all souls. He in whom all beings, in essence, dwell, is bhUtA-vAsah. "He who dwells in the devotees who perform His worship andsing His praise"
- bhUteshu bhajana parAyaNeshu prANishu AvAso yasya iti bhUtA-vAsah. "vasanti tvayi bhUtAni bhUtAvAsas-tato bhavAn" (279.52). SrI satyadevo vAsishTha gives some examples to illustrate His guNa of bhUtAvAsah in the context of His being the Controller of the five great elements. Even though we human beings are constituted of the five great elements, ourprincipal nature is that of pRthvI, while that of the fish is primarily thenature of water. The fish is created such that its lungs don't fill withwater as it lives in water, whereas the fish cannot live outside the water andon the land. Those that fly in the air are primarily of the nature of vAyu. He says that if the ashes from burnt cowdung are let stand for 50 years, therewill be an insect that originates from this that will be fire-proof, and thushas fire as its principal nature. Thus, bhagavAn has created the differentcreatures in different ways, and associated them with the pa'nca mahA bhUta-s indifferent ways. There is variety also in the way the different creaturesreproduce themselves. Some creatures that live in water lay their eggsoutside water, on land, because of the need for heat in hatching the egg. Even in poison, there are germs that survive and live and thrive. Allthese are illustrations of the fact that He is bhUta AvAsah - One in Whomeverything lives, and One Who lives in everything. SrI vAsishTha refersus to the Rg vedic hymn - vishNoh karmANi paSyata (1.22.19) - Look at vishNu'sworks, whereby He has let His great ways be seen. This nAma has been covered under nAma 700. The Abode and support of all souls. The word sarvAsu-nilayah consists of three parts: sarva, asu, andnilayah. asu is derived from the root as - bhuvi - to be(asti); asti iti asuh (SrI vAsishTha). The word asu is also used to refer to life, breath, etc. nilaya means abode, derived from the root lee - SleshaNe - to stick, to lie on. c) He is the final resting place for all souls at the time of pralaya. The sum total of all this is that all the beings dwell in Him and have Him as their support during their existence in this world and during their laya in Him during pralaya. SrI aNNa'ngarAcArya's anubhavam is that everyone is so captivated by Him that their very life depends on Him, and this why He is called sarvAsu-nilayah - "ellArum tammiDattilEyE prANanai vaittirukkum paDiyAga manOharamAi iruppavar". SrI rAdhAkRshNa SAstri suggests the explanation for the nAma as "He Who is the final resting place for all jIva-s" - "ellA uyirgaLum oDu'ngum iDam". Just as the indriya-s act as if they are independent of the jIva in the waking state, but lose this so-called independence in the sleeping state, the jIva merges into Him at the time of pralaya, and so He is the nilaya or the final resting place for all the asu-s or jIva-s.
a) He Who is never satisfied that He has done enough for His devotees. b) He Who cannot tolerate the offense committed to His devotees. c) He Who receives the prANa Sakti as His own and functions in the form of the jIvAtmA (SrI Samkara). d) He Who is beyond smell etc. e) He Who is unlimited (in His Glories) (alam - paryApti - end). f) He Who is in the form of Fire. i) He who rejuvenates His devotees who intensely long for Him (an - prANane ). This nAma occurred as nAma 294 in Slokam 32 earlier. The reader is referred to this earlier write-up as well. The nAma can be looked at as an-alah, a-nalah, or ana-lah. The different interpretations are derived based on the different ways of looking at the word. a) For the occurrence of this nAma in Slokam 32, SrI BhaTTar uses the meaning al - paryApti - to be satisfied, and gives the interpretation to the nAma an-alah as "He Who is not satisfied". In spite of all that He does for His devotees, He feels that He has done nothing to help His devotee - "na ki'ncit kRtam eshAm mayA iti avitRptah". SrI BhaTTar quotes the incident from mahA bhArata, where Lord kRshNa expresses His feeling of being permanently in debt to draupadi who cried out for His help. SrI v.v. rAmAnujan describes that even though He protected her when she cried out for help, and even though in addition He helped the pANDava-s by changing the day into night, violating His promise not to take to arms during the war, etc., still His heart was heavy that He did not do enough to help draupadi. As Lord kRshNa was departing to SrI vaikunTham after the purpose of His incarnation was completed, He said relating to this incident: RNam pravRddhamiva me hRdayAt nApasarpati(udyoga. 28.22) - "(That cry of help uttered by draupadi even from a distance calling me "govinda", even though I was far away in dvArakA) - that cry is never away from My mind, like a debt that has increased over time with interest accumulated on it". nammAzhvAr describes this guNa of bhagavAn in peria tiruvanTAdi 53 - "un aDiyArkku en Seivan enRE irutti nee" - "Your preoccupation is in contemplating on what You can do to help your devotee always". In this aspect, He is like the fire that is never satisfied with anything that is offered to it; it keeps consuming whatever is offered, and grows more eager to consume ever more. For this reason, the term analah also refers to fire. SrI rAdhAkRshNa SAstri gives another dimension to His not being "satisfied" - He is not satisfied with just the materialistic offering during His worship, but will be satisfied only when it is offered with bhakti or devotion. Bhakti is the only requirement for satisfying Him, and not any accompanying materialistic offerings. "At the time of destruction, two persons will not at all be forgiven by Me. I will kill Him who obstructs the conduct of this sacrifice, and also him who is ill-disposed to the pANDava-s". SrI rAmAnujan also refers us to the incident where Lord kRshNa refused to take the offering in duryodhana's house because of duryodhana's attitude of hatred towards the pANDava-s.
c) Under Slokam 32, one of the interpretations given by SrI Samkara is based on looking at the nAma as ana-lah. ana refers to prANa, and the root lA means "AdAne dAne ca - to take, to obtain". His interpretation is "anAn prANAn Atmatvena lAti iti ana-lah". The translators have generally translated this to mean that He receives the prANa Sakti as His own and functions in the form of the jIvAtmA, and hence this nAma. SrI satyadevo vAsishTha uses the same approach as above, but gives the interpretation that since bhagavAn ultimately takes away the prANa-s to Him, He is called ana-lah. a-sthUlam anaNvahrAsvam a-dIrgham a-lohitam a-sneham acc-chAyam …..
Brahman is neither big nor small, neither short nor tall, not colored, not wettable, can't be measured, etc. e) For the current occurrence of the nAma analah, SrI Samkara uses the meaning "limit" for alam - paryApati, and gives the interpretation that this nAma signifies that bhagavAn is unlimited in His energies and powers - alam paryAptih Sakti sampadAm na asya vidyata iti an-alah. "Of My Divine Glories, there is no end". This interpretation of SrI Samkara brings out the parattvam of bhagavAn. Notice that Sri BhaTTar has used this same root (al - paryApti), and given the interpretation that bhagavAn is unlimited in His desire to help His devotees (see a above). Both experiences are true, and are different dimensions of His guNa, the first expounding His parattvam, and the second expounding His vAtsalyam. Further appreciation of this difference in approach between SrI Samkara and SrI BhaTTar can be gleaned from the article that was posted earlier, comparing the two vyAkhyAna-s.
f) SrI cinmayAnanda takes the meaning "fire" for "analah", and comments that the nAma can refer to His being in the form of Fire and sustaining our body with the right amount of warmth that is needed for the sustenance of our body. sarvam tadindra te vase (Rg. 8.93.4; atahrva. 20.112.1; yajur. 33.35). i) SrI kRshNa datta bhAradvAj takes an approach different from others, and gives his interpretation starting with the root an - prANane - to live, to breathe. Using the uNAdi sUtra "vRshAdibhayaScit - (1.106)" - he derives the word analah, and gives the interpretation "Anayati samujjIvayati tapah: kRSAn sva-janAn sva-darSanena iti analah" - He Who rejuvenates His devotees who are engaged in intense tapas on Him, by giving His darSanam to them. The root from which the word darpa is derived is dRp - harsha mohanayoh - to be glad, to be proud; hA is derived from the root han - to kill. So the nAma darpa-hA means "He Who kills or destroys the pride in those who are afflicted with pride". SrI BhaTTar gives the above interpretation, and points out instances of bhagavAn destroying the pride of the deva-s and asura-s without destroying the deva-s or asura-s themselves. He gives as examples the instance of BhagavAn lifting up the govardhana mountain against the lashing rains caused by indra, the carrying away of the pArijAta tree from the garden of indra, chopping off the grove-like arms of bANAsura, etc. SrI Samkara explains the nAma as referring to bhagavAn repressing the pride of those that stray from the path of dharma. SrI rAdhAkRshNa SAstri points out that darpam refers to acts that are undertaken when one becomes ecstatic without knowing one's own position (relative to bhagavAn), and starts indulging in actions that are not consistent with dharma. This applies to those who do not follow the path of dharma, as well as to those who follow dharma but momentarily get carried away from the success of their dhArmic acts and start feeling pride in their accomplishments. In these later cases, bhagavAn imparts a lesson to these people by temporarily posing some obstacle. The dharma cakram writer gives a similar explanation, and describes darpa as the act performed by us when we do not realize that the self is different from the body, and falsely feel ownership for our action. BhagavAn creates obstacles as needed under these circumstances, and strives to remove this pride. SrI satyadevo vAsishTha explains the darpa-hA guNa of bhagavAn by alluding to the day-to-day events in our lives. He observes that most jIva-s consider themselves independent of Him and feel proud. Then, off and on when these same jIva-s observe someone else undergo suffering, momentarily their pride gives way to a temporary annihilation of a tiny part of their pride. Thus He performs His act of destroying the pride constantly (darpa-hA), even as He is the Bestower of pride to us (see next nAma). 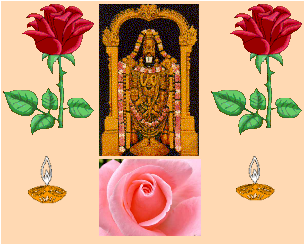 a) The Bestower of pride (to His devotees). b) The Bestower of beauty and attractiveness in everything. a) SrI kRshNa datta bhAradvAj gives the explanation - darpo harshah; tam sAttvikebhyo dadAti AtmAnam pradarSya iti darpa-dah. BhagavAn makes His true devotees proud by revealing Himself to them. SrI aNNa'ngarAcArya svAmi's anubhavam is that bhagavAn gives full enjoyment of Himself to His true devotees, and makes them feel proud of this experience. tiru ara'ngattu amudanAr expresses this kind of pride arising out of his association with emperumAnAr - "enakku Arum nigar illaiyE"; "Ar enakku inRu nigar, Sollil? ", "enakku enna tAzhvu iniyE?". SrI rAdhAkRshNa SAstri explains that bhagavAn gives pride (darpo garvah) to His devotees when they have to face the opponents of dharma. He gives the example of Hanuman bubbling with God-given pride when he was crossing the ocean going in search of sItA pirATTi, when he was addressing rAvaNa, etc. Thus bhagavAn gives the strength in the form of pride to His devotee as necessary. SrI cinmayAnanda points out that bhagavAn creates this pride in His devotees, which helps them in their urge to be the best among the righteous and the virtuous. This pride is their protection from compromising in even a small way in any act. This is positive 'pride' of a higher order, and not the pride referred to in the previous nAma. The dharma cakram writer comments that pride per se is not bad. If it is used negatively then it is bad, but if it is used to advance dharma, then it is good. It is like a knife that can be used to cut a fruit or cut the hand. A pure devotee of vishNu should feel proud about his position, and this will help him advance further spiritually. The feeling of pride reflecting as "I am following the path of dharma; I am a sesha (servant) of the Lord; I cannot be defeated in my objective of attaining Him" is a positive pride that is good. b) SrI satyadevo vAsishTha interprets the term darpa as referring to attractiveness, beauty etc. (dRp - harsha mohanayoh). His anubhavam is that the nAma indicates that anything that is attractive or beautiful around us has this beauty because Lord vishNu, the darpa-dah, has given this attractiveness to this object. In addition to his expertise in samskRt grammar, the veda-s, etc., SrI vAsishTha's expertise also includes Ayurveda, jyotisha etc. For this nAma, he indicates that the aspect of attractiveness arises from the influence of moon and Venus, and they in turn have their powers because of bhagavAn. He gives reference to the Sruti - tadevAgnis- tad-Adityas-tad vAyus-tadu-candramAh (yajur. 32.1). Some interpreters suggest the pATham a-darpa-dah. SrI cinmayAnanda gives the meaning "He Who never allows His devotees to become proud". The LIFCO publication, "SrI vishNu sahasra nAma stotram", which gives the alternatives for the viSishTAdvaita, dvaita, and advaita pATham-s, does not give this alternate version; thus, this version is probably a later addition by the more recent interpreters. c) He Who is proud. SrI BhaTTar gives his vyAkhyAnam using the nAma a-dRptah first, followed by the vyAkhyAnam for the nAma as dRptah as an alternate. SrI Samkara uses dRptah in his vyAkhyAnam. He never became proud, because of His majestic nature". He is "nanadagopan kumaran", in other words, One Who is an obedient Son to His father. (SrI v.v. rAmAnujan). SrI vAsishTha's anubhavam is that bhagavAn is a-dRptah (One Who is not proud) since He never violates any of His commandments under any circumstances, even though He is the Ultimate Controller of everything. b) dRptah - He Who is ever happy. SrI kRshNa datta bhAradvAj interprets the nAma as "nityam harsha mayatvAt dRptah", and "garva rahitatvAt a-dRptah" - "He is dRptah because of His eternal Blissful nature", and "He is a-dRptah because He is devoid of pride". c) dRptah - He Who is proud. SrI rAdhAkRshNa SAstri follows this line, and gives the interpretation that bhagavAn is proud as the Fighter for dharma. SrI vAsishTha: He is dRptah - dRpyati iti dRptah - One Who causes us to wonder as to who created all these worlds etc, (dRp – harsha mohanayoh). This is what causes the wise to seek the Ultimate Cause of everything, and thus releases them from sorrow. This dRptah-adRptah combination is analogous to His nAma-s vi-Sokah and Soka-nASanah, tadejati tan-naijati (ISAvAsya upanishad), etc. a) He Who is difficult to control (as child kRshNa). b) He Who cannot be constrained by the evil-minded (duryodhana). c) He Who is difficult to be held in concentration (except by those of trained mind). The word dharah is derived from the root dhR - dhAraNe - to hold, to bear, to support; The word duhkhena is interpreted in the sense of "with great difficulty or trouble". Thus, the meaning of the nAma dur-dharah is "One Who can be held in one's mind only with great difficulty", or "One Who is difficult to control and be held down physically (as child kRshNa)". SrI BhaTTar uses the latter meaning and interprets the nAma in terms of kRshNa's childhood leelA-s. The other vyAkhyAna-kartA-s use the former meaning to illustrate the difficulty of meditating on Him and realizing Him except by those with trained minds. "kaDainda naR-pAlum tayirum nee piRandaduvE mudalAgap peRRaRiyEn empirAnE! ", veNNaik kuDattai uruTTi iLam piLLai kiLLi ezhuppi kaNNaip puraTTi vizhittu kazhagaNDu Seiyum pirAnE! ", "kanRinai vAlOlai kaTTi kanigaL udira eRindu, pin toDarndu ODi Or pAmbaip piDittuk koNDATTinAi pOlum nin tiRattEn allEn nambi!" (all from periAzhvAr's neerATTam). "These men of little knowledge want to seize and bind Him just as a weak boy or girl think of keeping under control the blazing fire with a piece of cloth". "The wind cannot be caught by hand, nor can the moon be touched by the hand, nor the Earth be supported by the head of a man; so also, keSava cannot be caught by force". SrI rAdhAkRshNa SAstri refers to kRshNa showing His viSva rUpam like an uncontrollable elephant under rut when duryodhana tried to bind kRshNa in his court. c) A third interpretation for the nAma is that bhagavAn is beyond the grasp of anyone except through intense concentration and meditation extending over several births, and in this sense also He is dur-grahah. the path of the Unmanifest is very hard for the embodied to tread". SrI satyadevo vAsishTha gives the derivation "duhkhena dhartum Sakhyo dur-dharah" - One Who can be realized only with great difficulty. SrI kRshNa datta bhAradvAj gives the interpretation - duhkhena AyAsena dhriyate hRdaye a-samAhita-mAnasaih iti dur-dharah - He Who can be held only with great difficulty by those who do not have a collected and composed mind. This nAma will re-occur in Slokam 92 (nAma 866). Please refer to nAma 866 for additional anubhavam-s. The root from which this nAma is derived is ji - jaye - to conquer. SrI kRshNa datta bhAradvAj gives the explanation - na parAjitah kadApi kenApi iti a-parajitah - He Who cannot be conquered by anyone and through any means is a-parAjitah. SrI BhaTTar quotes several examples where the deva-s have declared over and over again that bhagavAn cannot be vanquished by anyone. indra tells karNa: "In the great fight, I give you the power to kill one thundering warrior, but this cannot be the one you wish to kill (arjuna), since he is protected by the Great Lord (kRshNa). KRshNa is none other than the Invincible Hari, Who had assumed the form of the Wild Boar, and Who is the Incomparable nArAyaNa, as declared by the vedic scholars". "In the fight you can ward off the attacks of all invincible and indestructible warriors except the long-armed arjuna who is unassailable even to the gods, since he is protected by kRshNa who is the Unknowable Deity Who bears the conch, discus and mace as arms". "Where kRshNa, the Lord of the yoga-s is, and where pArtha, the bow-armed arjuna is, there is prosperity, there is victory, there is wealth, and there is firm justice - this is my conclusion". "On the veracity of the following statements, may this medicine be pounded and be effective: "There is no defeat for vAsudeva"; "I have not witnessed the marriage of my mother"; "the ocean will never become completely dry". (These are all absolute true statements)". "Let this poison-removing mantra be effective just as the ocean is imperturbable, himAvan is unshakable, fire is unapproachable, and nArAyaNa is unconquerable". SrI BhaTTar also gives references to SrImad rAmAyaNam and mahAbhAratam: a-jayyah SASvato dhruvah (yuddha. 114.15); a-jitah khaDga-dhRk (yuddha. 120.14); yatah kRshNah tato jayah (bhA. udyoga. 6.79); etc. - "He is Inivincible, eternal and steady"; "He is unconquered, and is the Wielder of the Sword", "Where kRshNa is, there victory is certain". SrI v.v. rAmAnujan gives references to divya prabandham in support of SrI BhaTTar's vyAkhyAnam: "paRpanAbhan uyarvuRa uyarum perum tiRalOn" (tiruVai. 2.7.11); anRu aivarai velvitta mAyap pOrt tErp pAganAr (tiruvAi. 4.6.1). b) SrI Samkara gives the interpretation that bhagavAn is a-parAjitah since internally, desire and the rest cannot conquer Him, and externally, demons and others cannot conquer Him. c) SrI satyadevo vAsishTha also derives the interpretation for the nAma starting from the word para meaning Supreme - para eva kaScin-nAsti "na dvitIyo na tRtIyah" iti atharva vacanAt, tasmAt parAjitvasya a-sambhavAt bhagavatah aparAjita iti nAmnA samkIrtanam upapadyate - Since there is no one who is para (Supreme) except Him, there is no possibility of His being vanquished by anyone else, and so He is calleda-parAjitah.